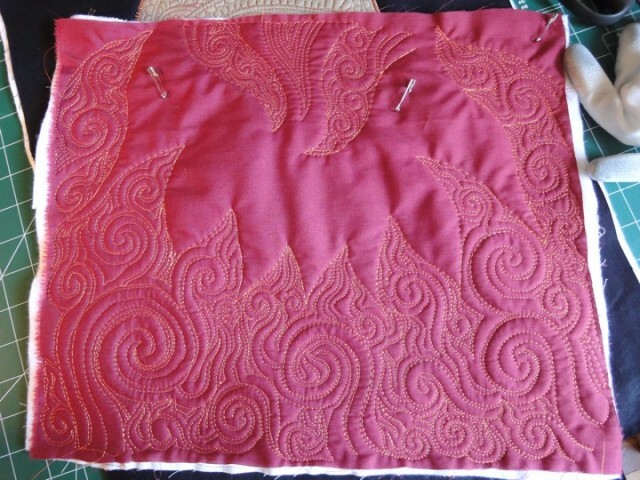 Oh how I love this combination of applique and trapunto. I wasn’t sure what to call it: double trapunto? Trapplique? It’s not a technique I’d seen before, but I’m sure others have done it because it’s obvious. Anyway, this technique is for me. This is actually a test for a larger piece I’m making for my wall. It’s in the Hippie craft tradition I so admired in my youth, so pardon the Orientalism – it’s an integral part of American Hippiedom. The pattern on the hand is based on mehendi, the spirally flames on Tibetan art, and the eye in the palm of the hand is plain ol’ Hippie mysticism. In case it’s not obvious, I free-motion quilted the hand shape which I then cut out and appliqued via machine satin stitch (tight zig zag) to another quilt sandwich. 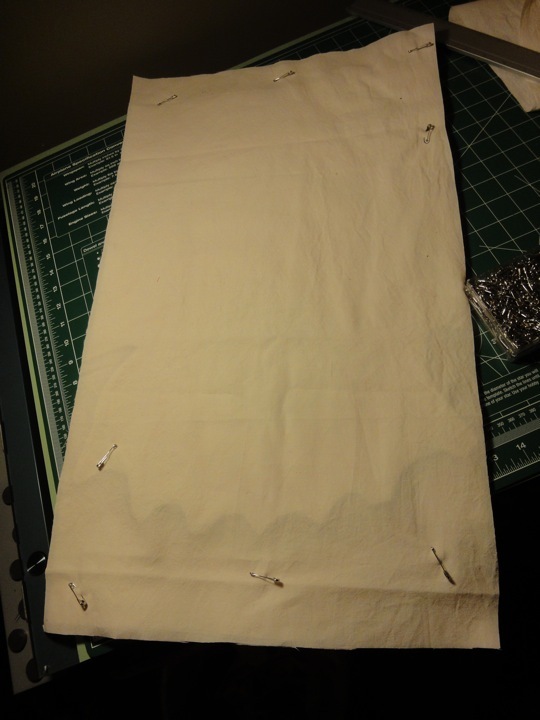 …which I cut out and arranged collage-style, and basted together with thread (because safety pins wouldn’t work). This is AMAZING! you are making me want to learn this trade!! I wish I could make something as awesome! Nina, you are truly amazing! 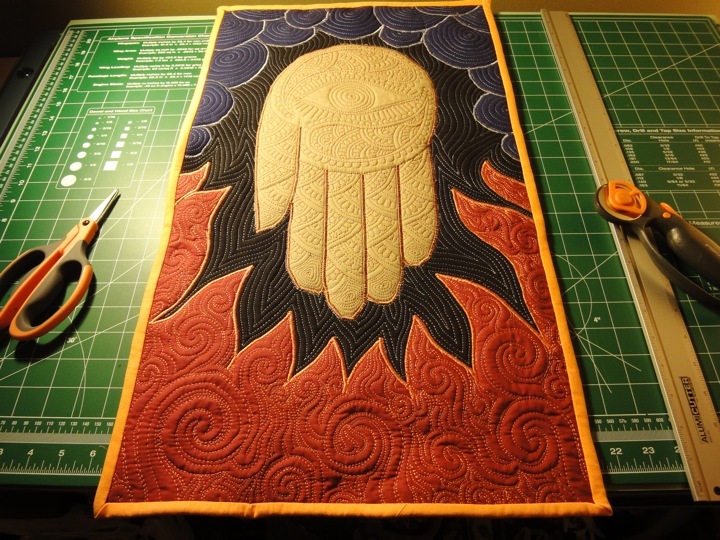 I’ve been quilting for 6 years and never thought of quilting stuff as separate units!!! AWESOME technique! Thanks Leah! I would love to see what you do with this technique! 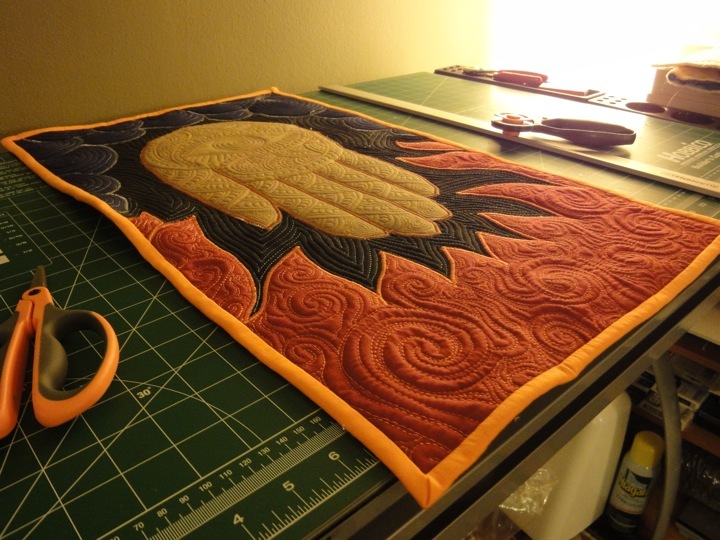 I neglected to mention the resulting quilt is perfect for the wall, or bed or pillow – but not for storage, since it can’t be folded up like a regular quilt. It’s supple enough to bend, and can be rolled loosely, but storing folded might distort it over time. 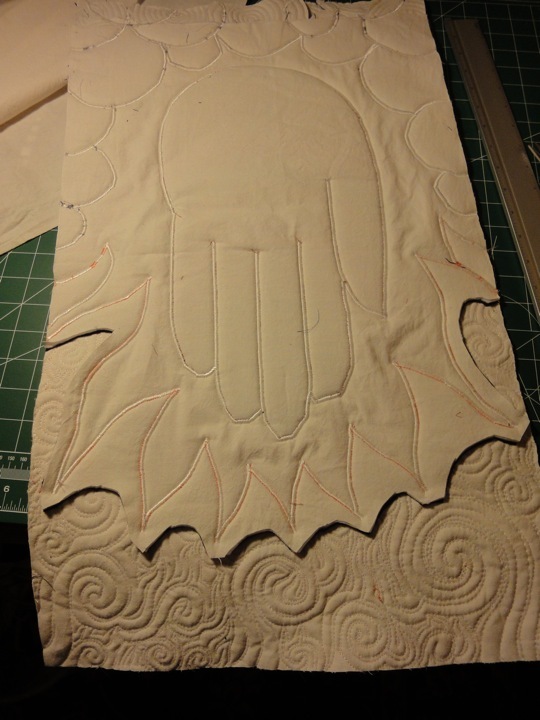 I also worry tight folding could stress the satin stitching through all those layers. Maybe I’m over-worrying because it’s only 1 day old. I guess I’ll see, as I detach from this one over time and become willing to let it do its thing. Maybe someday I’ll even…wash it. I wonder what that would do? Nina, I find your work incredibly inspiring…You are totally my favorite artist! Cheers! 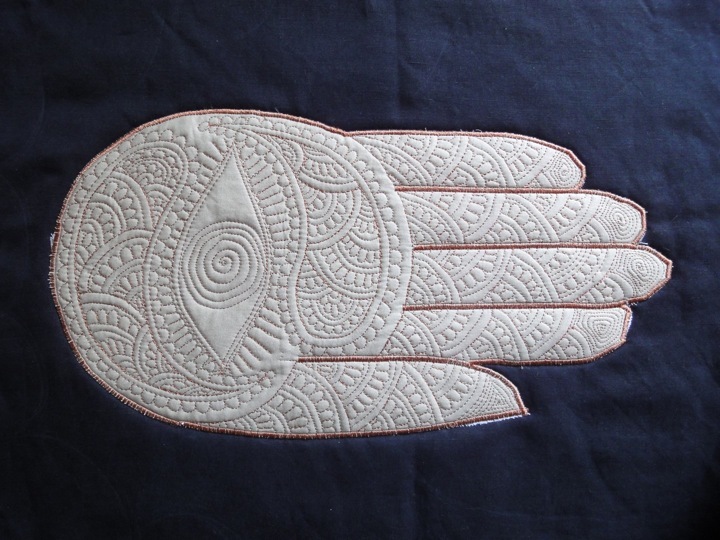 OK, I learnt something from this: apparently the hand-with-an-eye-in-the-palm is a hamsa, and appears in cultures all over the place since possibly forever ago…, which I guess means that there shouldn’t be any outstanding intellectual-pooperty claims on the general hand-with-an-eye-on-it idea…, which is good because I just happened to come up with an awefully similar-looking image when I was in high school, and I’d hate to find out that I `must have’ derived my thing from something someone else’s pooperty. Absolutely beautiful! Karl is right about the texture popping right through the monitor. I love this. Great job, I didn’t see where you are or your name so I don’t know if I have run across you before. This work isn’t familiar looking. Just found your website from a reference on Quiltart.net. 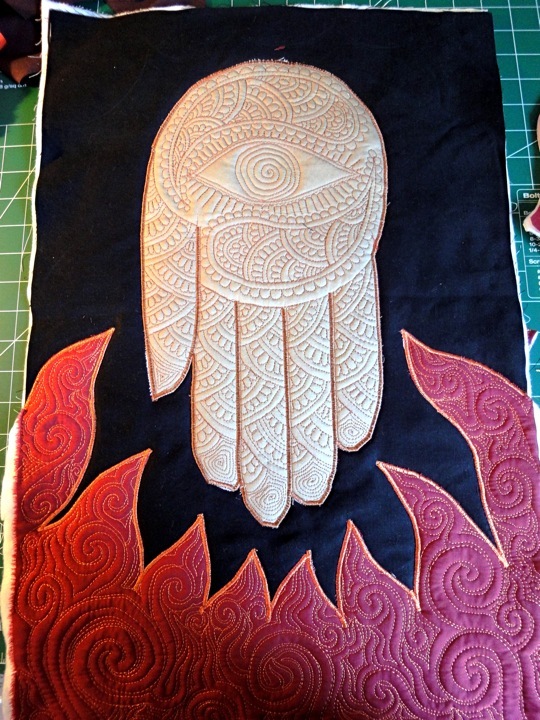 Your sewing work is amazing! 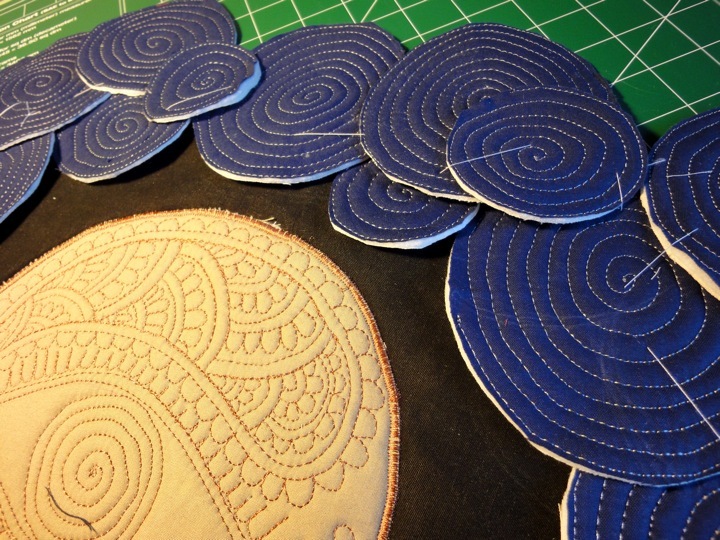 The control of your stitching/drawing line is beautifully fluid. I’ve been sewing for more years than you’ve probably been alive, and I’m just getting the feel for free-motion machine stitching. You’ve got a new fan! 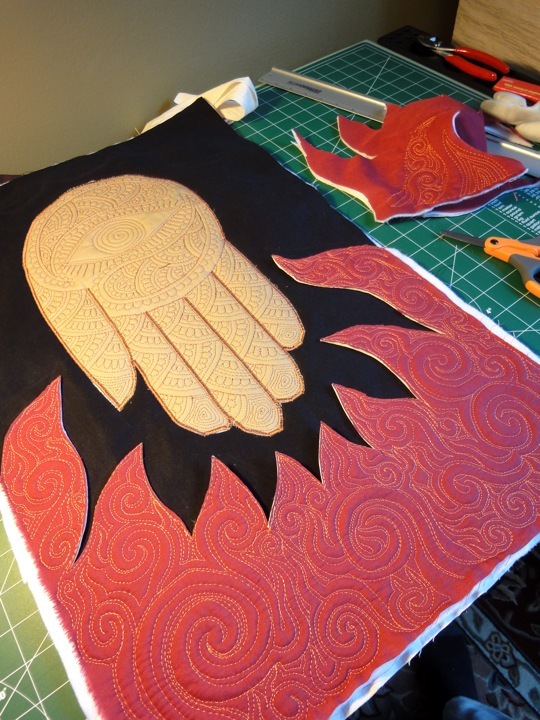 I like 505 temporary spray adhesive for appliqué. You might like it. I am very inspired by your quilts and copyright freedom. It puts into words a lot of things I have thought about but never really clarified. Thanks for the inspiration! Thank you very much for showing your lovely work. 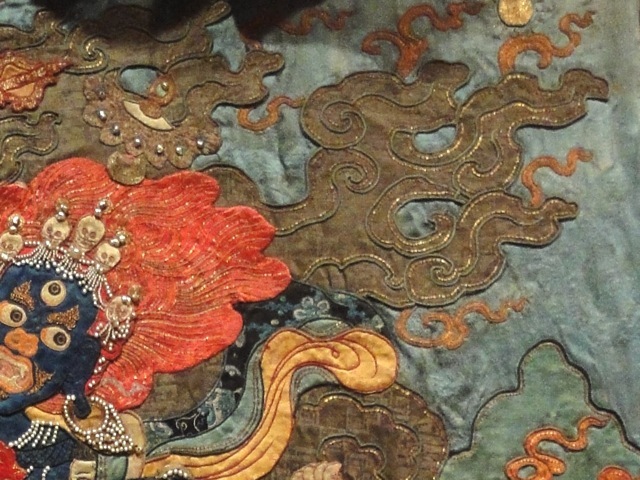 I just loved the texture in the wall hanging. Right now I am still trying to master the machine sewing from Leagh Day. Some day i will give this a try also. 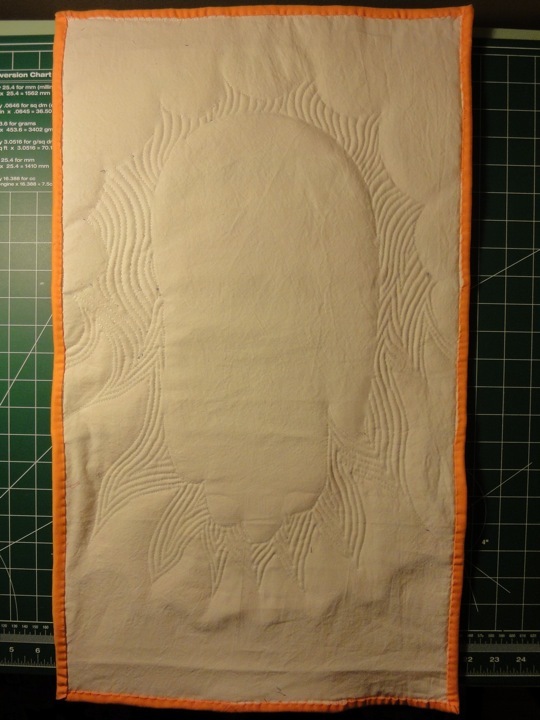 I love trying new techniques with quilting. Keep up the beautiful work. This is really amazing! It’s very Haightesque. So many ideas, so little spare time to execute them. 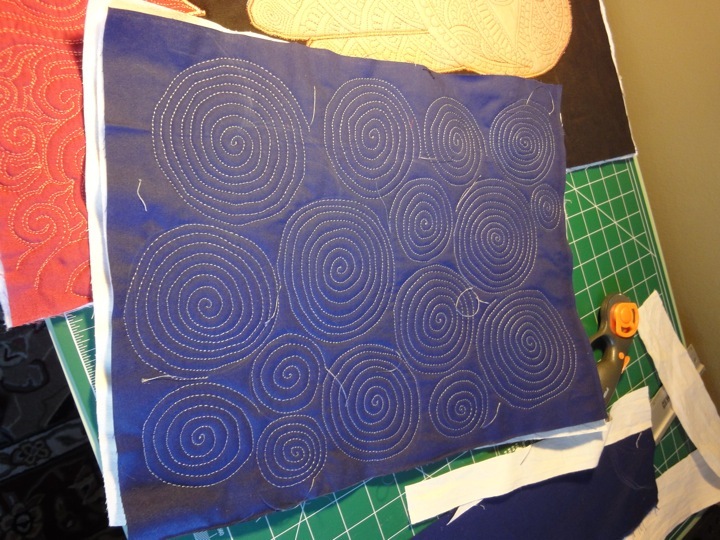 I just came over here from the Free Motion Quilting Project. You are an amazingly talented and creative person! My daughter and I love Sita Sings the Blues — the soundtrack is on my perpetual playlist. (We even gave our most beautiful and brave Brahma hen the name, Sita.) I enjoy your work in the Funny Times every month, and now this — your quilting is wonderful. Hope you don’t mind the gushing! Martha, your gushing made my day! Nina … you are amezing! That job are incredible! And so so beautiful! 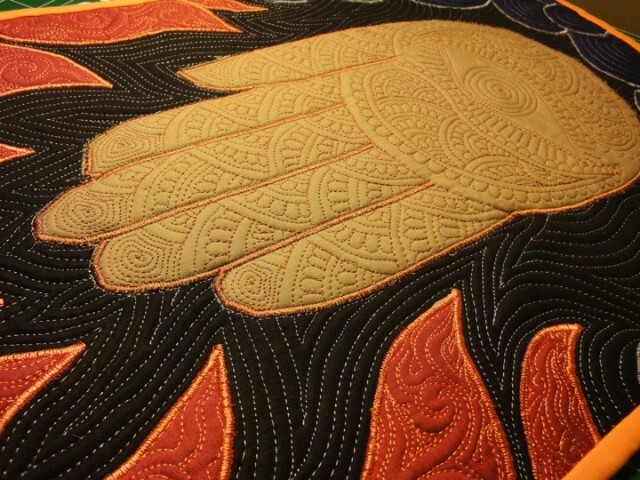 I just came over here from the Free Motion Quilting Project and I can not stop admire! I just loved the texture and in the wall hanging is perfect! Congratulation! Thank you very much for sharing the process with us! Have a nice day! A hug! Leah Day shared your site on hers regarding her “Trapplique” project. 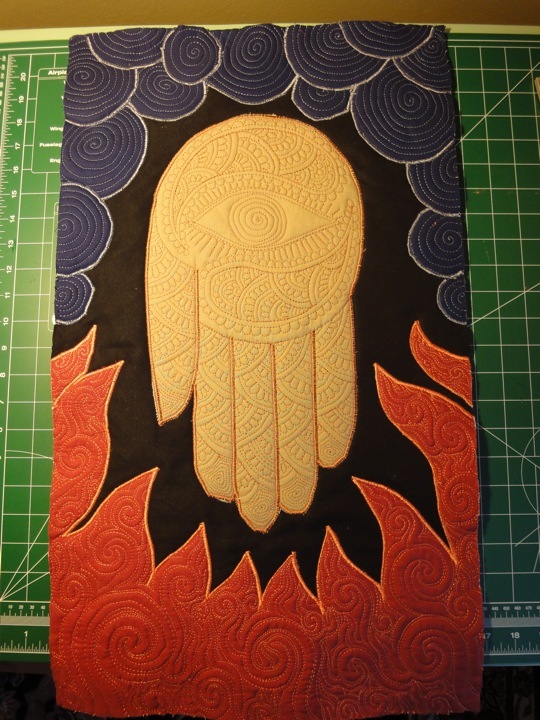 Your hand and flames project looks like total fun. Thanks for the idea. How beautiful and what a great way of making a wall hanging and such. I am going to try this soon. Thank you for such a great art. You can also thank Leah Day for mentioning you as that is how I found you. 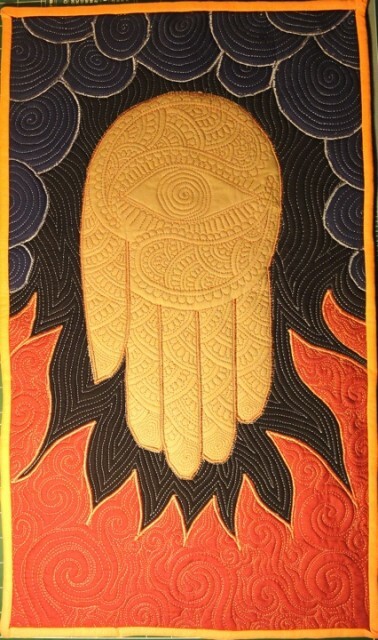 These are so cool, would love to have a quilt like these, thank you for sharing!